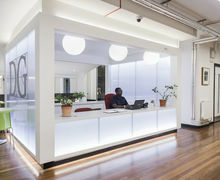 The College is housed in a newly renovated premises of nearly 60,000sq feet near Tower Hill in the City of London. As well as being surrounded by good transport links, our college is within walking distance from many of London's most famous attractions. Classrooms are bright and airy, with up-to-date technology. We invite you to take a virtual tour of the College. The library provides students with a place to work in a quiet and comfortable environment and contains reference books, past examination papers, university prospectuses and the internet. Computers provide access to interactive study aids for GCSE Sciences and Mathematics. Information on degree courses, universities and careers is available for students in the Director of Studies’ office. David Game College has its own servers that support Internet and web-based applications throughout the College. All students and staff have free access to the web through Wi-Fi and the College has an advanced filtering system that allows students to surf the web in a safe and secure manner. Students are allowed to bring their own tablets and laptops for independent study, but they must adhere to our IT and e-safety policy and respect teachers’ policies on the use of technology during lessons. 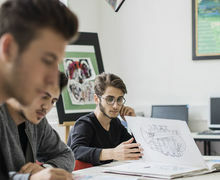 The College is developing its own Moodle system and classes generally adopt a blended learning approach, using YouTube and other sites or applications where these augment the learning experience. Our e-learning strategies are constantly being upgraded to reflect what works best for students, and that curriculum and specification-approved sites are used. The College has three custom built laboratories – a physics laboratory and a new biology and chemistry laboratory. The physics laboratory has been designed to allow students the best chance to engage in experimental physics and is spacious. 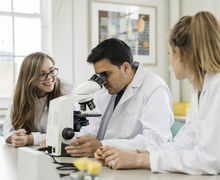 The new biology and chemistry laboratory was designed by the Head of Science and the tutors to allow students the best possible experimental experience. It is fully equipped to handle all GCSE and A level experiments as well as students’ own project work, plus contains state-of-the-art data recording and sensory equipment as well as up-to-date facilities for DNA analysis. The College has a well-resourced Art Room as well as ICT facilities and Photoshop software. The College has many original paintings on display in its corridors and classrooms, several of which are the work of the art teacher. 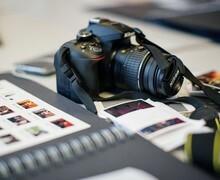 Photography is taught using a suite of Mac computers, a darkroom and a photographic studio for shooting portraits and still-life, complete with new studio flash and tungsten lights and three professional backgrounds. In addition to GCSE and A level Photography, the College runs separate digital Photography courses running from one day to eight weeks, which are open to all. 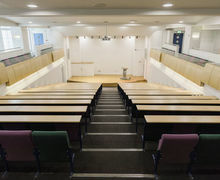 We have a number of specialist classrooms including two auditoriums seating 70 and 200 students. We use our large auditorium for school plays as well as for seminars and workshops. If you’d like to book any of our auditoriums or facilities, please contact us at info@davidgamecollege.com. 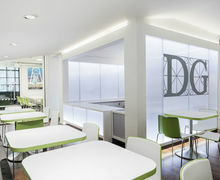 The canteen in David Game College provides facilities for students to eat their own snacks or to buy hot and cold drinks. 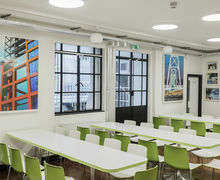 It also offers a place for students to relax, meet friends and to watch Sky News and BBC News. In addition, the College is well located for the many vibrant cafés and eateries. "The canteen could be defined as one of David Game's strongest features. I recommend it to anyone..."
"The food is great, the atmosphere is lively I would say that it is the signature of our College. We owe all of these joyful moments to Onat who runs the canteen flawlessly..."
The College takes security very seriously and is mindful of its responsibility to safeguard all our students so that they learn and make progress in a safe and secure environment. To this end, the College has its own security system that covers nearly all areas of the College’s public floor space, using a network of high-definition cameras. The key monitoring terminals are located at the security desk on the ground floor and are continuously monitored; further terminals are in reception. All visitors to the College must report to the security officer at the front desk and sign in and confirm their right to be in the building via an appointment.